(19.01.2014) Here is the Award of KoBulChess Fairies 2012. It is on english and german languages. Congratulations to the awarded composers and many thanks to the judge Manfred Rittirsch! 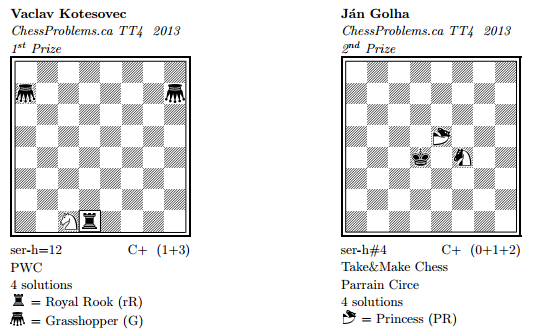 3rd FIDE World Cup in Composing 2013 – Fairies! 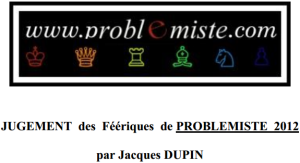 Almost all preliminary results of the 3rd FIDE World Cup in Composing for 2013 are ready! 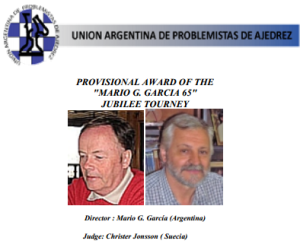 The PDFs of the awards can be found under the Announcement, on the 3rd FIDE World Cup in Composing 2013 page of WFCC website. Congratulations to the winners and all participants! Today I’m happy to see the Award of Fairy Section! And using a chance, I congratulate fairy composers, winners and participants, and especially the Cup Winner – PROF. S. K. BALASUBRAMANIAN !!! WCCI 2010-2012: Results become final! The Results of WCCI 2010-2012 announced as final! are published on the WFCC website! In total 37 countries participated in the tournament with 553 compositions by 257 composers in seven sections. The winner of the 9th WCCT is Russia, ahead of Ukraine and Israel. Sincere congratulations to the winners and to all participants!! !